Baseball in New York is very popular. From April through October you can visit a baseball game almost every day. 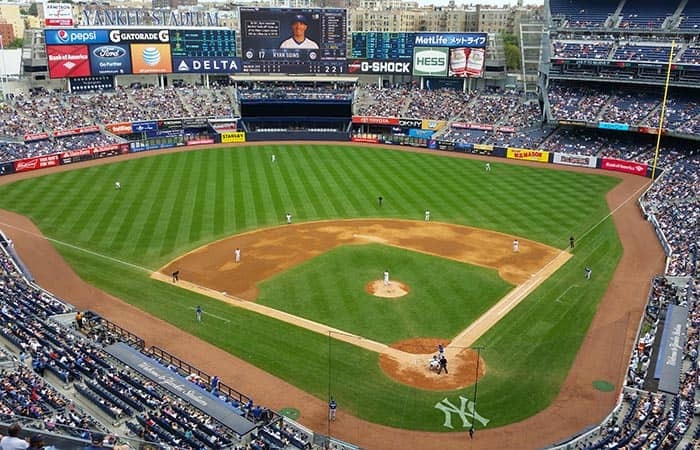 I’m a big baseball fan, and if you’re looking for something fun to do then go see the New York Yankees or the New York Mets play! For those who don’t know a lot about baseball, I’ve put together this page. I personally don’t think you need to know a lot about the game to enjoy the atmosphere. The two biggest baseball teams in New York are the New York Yankees and the New York Mets. The Yankees are the best and most successful team in the world, having won 27 World Series championships. Then there’s the Mets, which are their rivals, but to be honest I wouldn’t call them rivals at all. So if you’re in New York and can see either team, which one are you going to pick? Yes, the Yankees of course. The real Yankee rivals are the Boston Red Sox. They’ve been at it for 100 years. So if you’re in New York and can go to a New York Yankees vs. Boston Red Sox match, then go for it! The New York Yankees play six times a week during their season. So if you’re visiting in those months (April – October) then you will probably be able to see a game. I’ve written a page about New York Yankees tickets. It’s safe and easy to order online, and you can read my tips on the best seating. A baseball game lasts anywhere between 2 and 4 hours and starts with the national anthem. This in itself is a fun experience! Then the game starts. I could talk hours about baseball, but in short, each team needs to score a run and the one with the most runs wins. What’s a run? Pitcher throws ball → Batter hits ball → Batter runs all three bases back to the home plate. The opposing team needs to stop a run by getting the player out. There are lots of ways to do this. One way is if a batted ball is caught or if the runner is tagged. Once there are three outs, the teams switch between batting and fielding. When both teams have batted, an inning is complete. After the seventh inning there will be singing again. A baseball game usually lasts nine innings. The Subway Series are the games that are played between the New York Yankees and the New York Mets. It’s called this because you can ride the subway from one stadium to the other. Pre-season tickets are for games that are played before the official baseball season has started, most of them will be in the beginning of April each year. These can be cheaper than regular tickets. Playoff tickets on the other hand are usually more expensive because it means that the team is doing well in the annual championships (finals). In most cases you can already buy tickets to such games, but it’s clearly stated that the game will be played “if necessary”. Playoffs are played in October and November if the team reaches these finals. Eric’s Tip: I think going to a baseball game is great. Even if you still don’t get how it’s played. In truth it’s more about the atmosphere. Sometimes New York Mets tickets are cheaper, but it depends on how well they’re doing. Stay until the seventh inning, that way you’ll have experienced the national anthem as well as the performances.